The contents of this book focus on the recent investigations in molecular bi- ogywhereapplicationsoftopologyseemtobeverystimulating. Thevolumeis based on the talks and lectures given by participants of the three-month p- gram"TopologyinCondensedMatter,"whichwasheldintheMaxPlanck- stitut fur Physik komplexer Systeme, Dresden, Germany, 8May-31July 2002, under the scienti?c direction of Professors M. Kl eman, S. Novikov and - self. The aim of this program was to discuss recent applications of topology to several areas in condensed matter physics and molecular biology. The ?rst volume "Topology in Condensed Matter" is concerned with m- ern applications of geometrical and topological techniques to such new and classic ?elds of physics like electron theory of metals, theory of nano-crystals, aperiodic and liquid crystals, quantum computation and so on. This volume is published simultaneously in "Springer Series in Solid-State Physics." 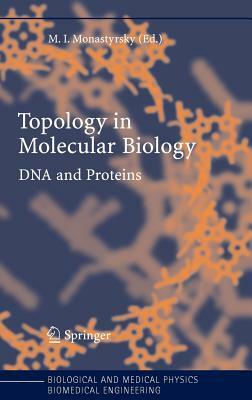 The present volume gives an exposition of the role of topology in the theory of proteins and DNA. The last thirty years a?rmed very e?cient - plications of modern mathematics, especially topology, in physics. The union of mathematics and physics was very stimulating for both sides. On the other hand, the impact of mathematics in biology has been rather limited. H- ever here also some interesting results were obtained. In particular, there are applications of knot theory in the theory of circular closed DNA. The - cent discoveries in molecular biology indicate future successful applications of topology. M.Monastyrsky is a professor of mathematics and theoretical physicsat the Institute of Theoretical and Experimental Physics, Moscow, Russia, graduated the mathematical department of Moscow state university(1967), author of numerous papers in diferent fields of mathematics andtheoretical physics including the monograph: Topology in Gauge Fieldsand Condensed Matter (Plenum,1993 ) and two other books: Riemann, TopologyPhysics, Birkhauser, Boston,1999,2nd ed. and Modern mathematics in thelight of Fields medals, AKPeters,1997.I gave invited plenary talks onmany conferences and was the visiting professor of many universitiesand institutes including IAS(Princeton), Harvard, Princeton and YaleUniversities (USA), Cambridge and Oxford Universities (Great Britain), IHES and Universite de Paris (France).